London Art College Yearly Meeting! 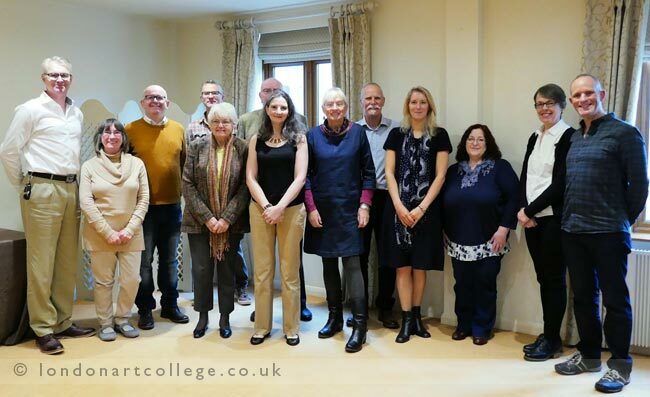 Here is a wonderful photo of some of the tutors and staff who attended our yearly meeting in Bristol in October 2018. A very exiting meeting with lots discussed. Some of our tutors were unable to make it, however here are a list of attendees from left to right. Rupert Douglas-Jones, Rona Cox, John Byrne, Jem Bowden, Ann Fisher, Peter Fisher, Alison Douglas-Jones, Maggy Roberts, Stewart Roberts, Melanie Phillips, Polly O’leary, Vanessa Weaver and Paul Weaver. As you may have already seen on our blog, the winner and runner up of the London Art College Competition has been announced. The competition winners were voted for by the tutors and staff while at the meeting. We always view all of the finalists on a big screen, using a projector and chat about each painting. We then choose our two favourites for winner and runner up. This year Mike Masson and his wonderful painting of Sasha won. Rob Leuchtenberger with his incredible painting of the Ocean Snake came a very close second. You can read about the paintings and see photo of Mike and Sasha on their dedicated blog posts. If you would like to see all of the entries, why not visit our website’s competition page! Runner up of the London Art College Competition!